Are you just a little love bug who wishes that she had just a few more spots than just on her wings? We know the feeling. Sometimes the more little black spots on them, the cuter the lady bug is. Plus having bare legs when you're trying to disguise yourself as a ladybug is a pretty dead giveaway (not that you don't look super cute without them.) Well drawing all those dots on would be quite a bother to both put on and wash off! 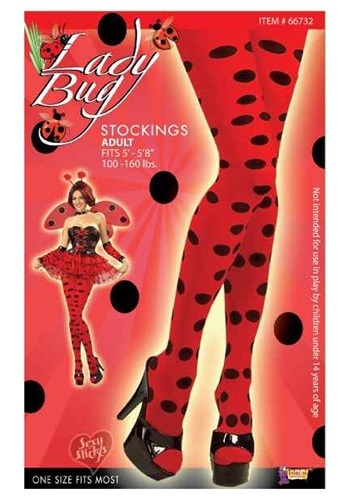 Add a pair of matching leg candy to your Lady Bug costume. In these delectable Lady Bug Stockings, you'll attract the right kind of gentleman caller. But you don't have to stop there with these hot polka dots. What about becoming a sweet little watermelon with these leggings as the meat and seeds. The possibilities are only as limited as your imagination.